Alex discusses his Delfina Foundation exhibition with Director Aaron Cezar. Alex Mirutziu, Between too soon and too late, 2018. 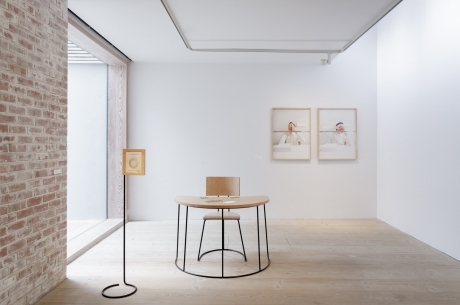 Installation view, Delfina Foundation, London. Photo Tim Bowditch. Courtesy Delfina Foundation and European ArtEast Foundation. Aaron Cezar: Throughout your career, poetry, philosophy and literature have strongly influenced your artistic practice. How do you relate to words versus images? Alex Mirutziu: For me, words are more powerful than images. The image is always in the word. I am interested in how words conspire to bring forward meaning in relation to other words or body language. I feel intimately close to the poetry of Graham Foust and W.H. Auden. In Where is the poem(2013-), I bring these two poets together in the prospect of establishing meaning by destabilising each other. Foust highjacks Auden and vice versa. Auden’s texts are footnotes to Foust, which are performed by one hand and graphite powder. The hand gestures are an attempt to get into the text, to then try to overcome it – a movement that makes the poem vulnerable in my opinion. This strategy is also part of the performance-video Dignity to the unsaid (2017), where the actors punctuate their choreography with instructions for the public in the form of notes. By doing that, they create a subtle movement between the presence and absence. AC: What drew you to the work of writer and philosopher Iris Murdoch? AM: I was aware of Iris Murdoch’s oeuvre for a long time before I decided to look deeper into her philosophical work. As an artist, I am particularly interested in her thoughts on how it takes courage to destroy what one thinks is not good in one’s work and the omnipresent temptation to be good, philosophically speaking [which by her moral philosophy definition would mean the opposite of expression and projection of the ego]. During my residency at Delfina Foundation, I visited Murdoch’s archives at Kingston University. Rather than focus on the period of her career when she was the most prolific, I looked at material that she produced later in life when signs of Alzheimer’s Disease were noticeable. Much of her work from this period is unfinished and littered with corrections and unformed thoughts. AC: Can you expand on the title of the show, which is inspired by Murdoch’s concept of approximation, where one locates or loses meaning? 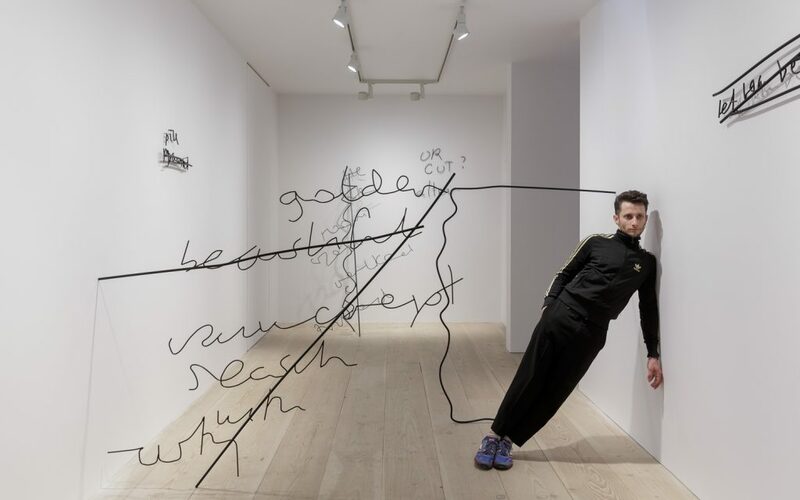 AM: The exhibition’s title is a quote by Murdoch that discusses the problem of form and time, loss of form, perfect timing and bad timing, in relation to the production and reception of creative works. In the exhibition, I try to configure what is between ‘too soon’ and ‘too late’, which Murdoch defined as a ‘tiny space’ which one has to enlarge. She implies that one should prolong the experience of this space, to sit on difficult questions, and resist the temptation to quickly move from the provisional to the finished thing. In the exhibition, I attempt to suspend viewers in this tiny space, which requires a certain level of commitment in order to arrive at meaning. AC: How did you try to make sense of Murdoch’s archival material through some of the works in the exhibition? AM: Heavy X looks at thick slow on blue thick blue(2018) and White rocks up, pink went out to distant ships (2018), I attempted to give a form to Murdoch’s incomplete descriptions and erratic metaphors about the sky and natural landscape. 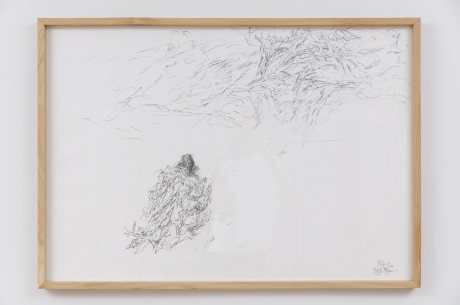 The title of the works are the descriptions that inspire the drawings. 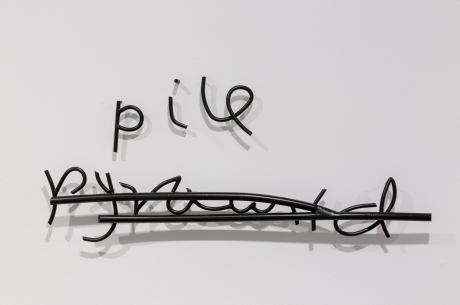 The series of works entitled To continue or abandon(2018) are large metal sculptures of hand corrections or scribbles that Murdoch made while working on poems and lectures. These sculptures physically place the audience within Murdoch’s thoughts without any context. While in Gestalt me out (2018), I wanted to put forward the idea that the author is always included in the inscription of what he/she is inscribing, that there is no way out. The desk includes impressions of my hands and elbow and an image of Murdoch’s tea-stained notebook. In the video The best I can do at the moment (2018), which can only be viewed through a QR code, I use the format of promotional trailer to sum up, and perhaps even, destabilise the exhibition through humour and happenings in my studio. I go about half routines in the studio and in the meantime reflect on my own instability and intellectual ‘muddle’. AC: What is the role of time – or more precisely, timing – and space in the context of the exhibition? AM: They play a crucial role. For example, Prepared Poem #3 (2018), a sculpture layered by transparent slides with lines from one of my own poems, requires visitors to move around the space in order to read the work. However, any attempt towards a perfect reading results in failure. It is, therefore, up to each viewer to make sense of the poem from their own perspective in their own time. AC: Can you talk about the nature of performativity in your works? AM: Generally, my works are performative in the sense that they allow viewers the freedom to adapt and complete the work, physically or metaphorically such as Prepared Poem #3. Because my works touch on ‘what’ and ‘how’ something is held together (not ‘why’), I am interested in ways to approach, find or loose meaning. One must not forget that even stasis is an action, moreover the outcome of a decision. My intention is to slow down the viewer, to challenge one’s presence. I am also interested in the sort of commitment that comes from doing by being, not the other way around. For example, I am making a new performance for Block Universe 2018 entitled Doing Sub Thinkingthat addresses this. Referencing philosophical thought, national displays of power and collective agency, the work seeks to illustrate the performative forces at play in society. We are exploring the de-personalisation of an individual within a crowd to reveal the intangible gaps between thought and action within group dynamics. 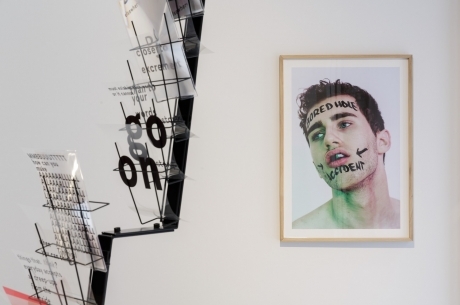 Between Too Soon and Too Late is on show at Delfina Foundation from 26th April to 2nd June. The exhibition is co-commissioned by Delfina Foundation and European ArtEast Foundation. Doing sub thinking will be being staged in the courtyard of the Royal Academy on 2nd June at 3pm as part of Block Universe 2018, co-commissioned by Delfina Foundation and European ArtEast Foundation.